If you aren't much of a gamer, you probably don't know about DC Universe Online, which is celebrating it's 6th anniversary. This Multi-player roleplaying game is set in a DC universe in which millions of normal people were infected with "exobytes" by Lex Luthor, giving them superpowers, in order to fight off an invasion by Brainiac. I was told Aquaman didn't appear much in the game, but I've been playing it for a few months, and he's made a few interesting showings. The big one people who play as heroes see the most is a leveling mission in which your character and Martian Manhunter look for the reason Atlantis is invading the surface world. 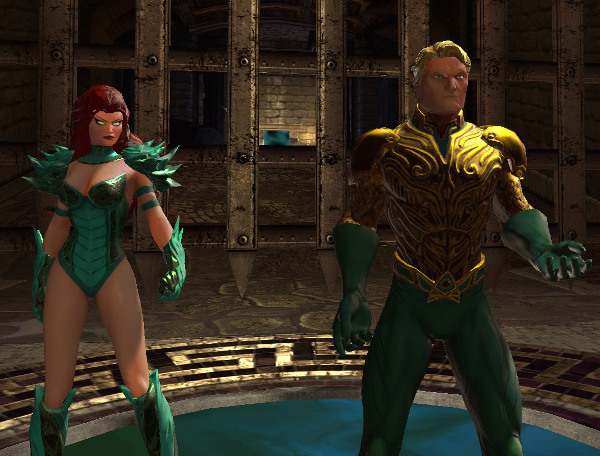 A suspiciously non-Mera-like Mera and Aquaman face off against heroes in DC Universe Online. It ends with a confrontation with Aquaman and Mera - or is it Mera? - in which you must first battle Aquaman, then battle the real threat. The game also has a summer event that usually last a few weeks to a month in which you assist Aquaman in battling the forces of Ocean Master, who are invading Metropolis. Aquaman is also available as a vendor in the Watchtower, selling gear. The game has gear-based progression, so having him as one of the vendors is natural. Many other heroes also appear as vendors. The game is "free-to-play" in the sense that you can create a character and level it up quite a ways without needing to buy membership or downloadable content (DLCs), but there are heavy limitations on free players. However, all Aquaman content that I've seen so far is available to free players - although the summer event is only available for a time in the summer. The game can be played on Playstation (3 & 4), XBox, and PC.